Are Human Rights Really ‘Universal, Inalienable, and Indivisible’? Following centuries of ongoing revision, repetition and reconceptualisation, international human rights theory and practice continues to grapple with three integral concepts: universality, inalienability, and indivisibility. These concepts are perceived as being essential to its continued validity, yet themselves also embody human rights’ most pressing critiques. 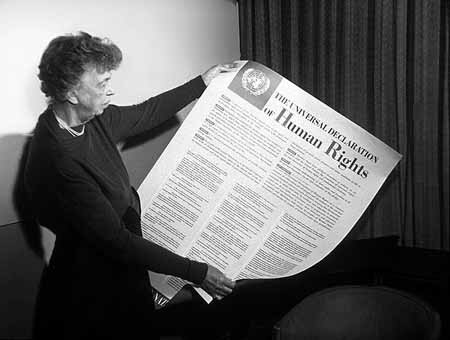 Universal human rights theory holds that human rights apply to everyone simply by virtue of their being human. The most obvious challenge to the universality factor comes from ‘cultural relativism’, which maintains that universal human rights are neo-imperialistic and culturally hegemonic. While this perspective may be tempting, the relativist argument encompasses a debilitating self-contradiction; by postulating that the only sources of moral validity are individual cultures themselves, one is precluded from making any consistent moral judgements. Further, the cultural relativist in fact makes a universalist judgement in arguing that ‘tolerance’ is the ultimate good to be respected above all. Hence, it is a naturally self-refuting theory that engages universalism in its own rejection of the concept. In a practical sense, the cultural relativist position is foundationally incompatible with human rights, as human rights themselves could not exist if they were stripped of common moral judgement. And yet, the question remains: even if human rights must be universal in order to remain coherent, what should we do when faced with practices or cultures with which ‘our’ version of human rights clashes? Should we stand idly by when atrocities are committed? Surely not. While universal human rights should not be geographically or culturally ‘flexible’ (so as not to undercut their entire purpose), we must see the continuum of rights and culture as relational, not exclusive. Along this vein, some have argued that we actually need to see human rights as a culture in and of itself – a collective learning about what is in the best interests of humans around the world. This is because, as cultures are non-homogenous and inherently malleable, so too must be their conceptualisations of human rights. Essentially, human rights must be able to absorb cultural difference. Further still, other commentators have taken issue with the question itself, noting that dichotomised and uncompromising questions over whether human rights should be universal or not actually tend to “arbitrate the correct form of human existence”. In this way, the ability of human agency to integrate, move between and even override cultures is often overlooked. Instead, he argues that the best way forward is for people remain aware of alternative value systems to be able to freely move in and out of them as per their preference. While this may be seen as too liberal or individualistic (as is a common critique of ‘western’ human rights), it best gets to the core of what the purpose of human rights ought to return to: the human. By definition, inalienability involves the “inability of something to be taken from or given away by the possessor”. While the 1776 United States Declaration of Independence, the 1789 Declaration of the Rights of Man, and the 1948 Universal Declaration of Human Rights repeatedly affirmed that rights were inalienable, it remains today that very few can agree on the meaning of this. Early philosophers and scholars such as Locke, Mason and Lilburne spoke of natural rights in terms of inherentness, natality and inability to be surrendered, helping later thinkers better conceptualise the core of inalienability by asking who the ‘human’ is in human rights. Constant debate on this topic has brought out the best and worst in more recent philosophers. For example, one scholar notes that one must contribute to both self and society in an autonomous capacity in order to be a rights-bearing person. He thus doubts whether rights could possibly apply to infants, the “severely mentally retarded”, or people in irreversible comas. Thankfully, others have stepped away from crude biological distinctions to conceptually consider the multiplicity of ways in which one might be considered ‘unhuman’ such as through heavily gendered and animal-human power dichotomies . In such cases, victims are often stripped of their personhood and basic rights, revealing the alienability of rights in practice. Along this vein, Hannah Arendt articulated one of the most timeless perspectives on inalienability on the backdrop of the Holocaust. Noting the lack of tangible access to rights experiences by refugees by virtue of their statelessness, Arendt concluded that the only true right was ‘the right to have rights’ in the sense that modern rights had become linked inextricably to the emancipated national state. Of course, important critiques have been lodged against Arendt, such as that of Jacques Rancière, who finds that humans can never be entirely depoliticised and devoid of rights (even when stateless) as they are inherently political beings by the mere fact of birth. However, while somewhat convincing, Rancière’s critique should easily be dismissed as far too abstract to be of great use in the face of the severe and ultimately tangible human rights violations occurring today. Given today’s challenges of displacement and statelessness, it therefore seems more helpful to eschew abstract reasoning surrounding inalienability and acknowledge that rights are inseparable from statehood and citizenship in the international human rights system. As Arendt reasoned, “inalienability has turned out to be unenforceable”. Turning to indivisibility, this principle maintains that the implementation of all rights simultaneously is necessary for the full functioning of the human rights system. Beyond discussions of violations, indivisibility is equally the idea that no human right can be fully implemented or realised without fully realising all other rights. Those who fall within the indivisibility camp reason that the enforcement of human rights is arbitrary and incomplete without a commitment to indivisibility, and that anything less than simultaneous implementation of all human rights may fuel dangerous rights prioritisations by governments (i.e. emphasising first or second generation rights while neglecting third generation ones will mean that all rights values suffer). Issues surrounding the prioritisation and partial fulfilment of human rights are at the core of the indivisibility question. Here, Nickel makes a number of strong arguments against indivisibility by distinguishing the concept from interdependence. For example, an arm and leg are not mutually indispensable (indivisible) because one can function without the other. While they may be interdependent to some extent, they are not indivisible. Conversely, a heart and brain cannot function irrespective of each other, thus making them indivisible by definition. Such is the distinction we must make with human rights, too. It isn’t necessary for every single right to be fully realised in order for the others to mean anything at all. If this were not the case, it may be terrible news for developing countries; rather, such countries do not automatically enter into conflict with the principle of indivisibility if they prioritise some rights over others along a given timeline in light of available resources. This line of thought is an important critique of others, such as Donnelly, who insists on the centrality of system-wide indivisibility, and whose argument fails to appreciate this indivisibility-interdependency distinction. It is therefore apparent that some of the most widely accepted and central tenants of human rights – universality, inalienability, and indivisibility – emerge as highly contentious upon close inspection. Yet, rather than undercutting the entire concept of human rights, these critiques simply remind us to continually revaluate our assumptions of rights to make them ever more inclusive and ever more tangible to those who remain on the outside, looking in. Rorty uses the example of the dehumanization of Bosnian Muslims at the hands of Serbian soldiers during the Bosnian war. He explains that this reduced Bosnian Muslim to an ‘animal-like’, or non-human status relative to his/her oppressor, thus stripping the victim of any relevance in discussions on ‘human’ rights. *Leila Nasr is the Lead Editor of the LSE Human Rights Blog. She can be reached at L.Nasr@lseac.uk. This entry was posted in Alumni, Editorial, Law, Theory, Uncategorized. Bookmark the permalink.